Create a SharePoint 2013 Web Application is the subject of a new tutorial in the kalmstrom.com Tips section. Use web applications to contain one or several site collections that should have special content or features. Farms are the highest level of SharePoint components. Within a farm you can have several web applications. 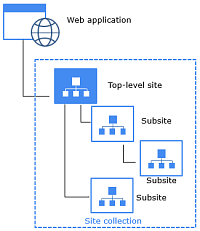 Each web application can have several site collections, and each site collection can have several sites, but within a web application all site collections and sites normally have the same domain (and subdomain) name and the same log in method. Before you can create a site collection you must have a web application for it. The web application consists of an Internet Information Services (IIS) website, and it is the logical unit for the site collections that you will create. It always has a unique domain or subdomain. There are lots of reasons for creating more than the two default ones (one for the Central Administration and another for your default site collections), but the basic cause is that you want to separate units and isolate them from the rest of your SharePoint sites. Then you can create another web applicaton for this purpose. You might need to create a new login system (for example via Forms Based Authentication) or provide your various departments with different SharePoint features. In my demo I create a new web application because I want to use a separate URL for my demo sites. As I must create a new URL for my web application, I first need to make sure the DNS can respond to that URL. To do this I go to DNS under Administrative Tools on the SharePoint server. In the demo I am working directly on the server, so I can just go to the Start menu and select the Tools. I create a new lookup zone and a host for the address I want to use, and to make sure it works I ping the URL from the command prompt. When you install SharePoint the central administration IIS site is created automatically, and it is also reached via the Administrative Tools. Here, in the section Manage web applications, is where new web applications are created in a few steps. I must also fill the new web application with content, and for that I create a site collection. Microsoft has made that easy by giving a link to the creation form in the "Application Created" message. Please watch the video below and read the step by step instructions on the Tips page. Creating a new web application is not complicated, but it is extremely useful!